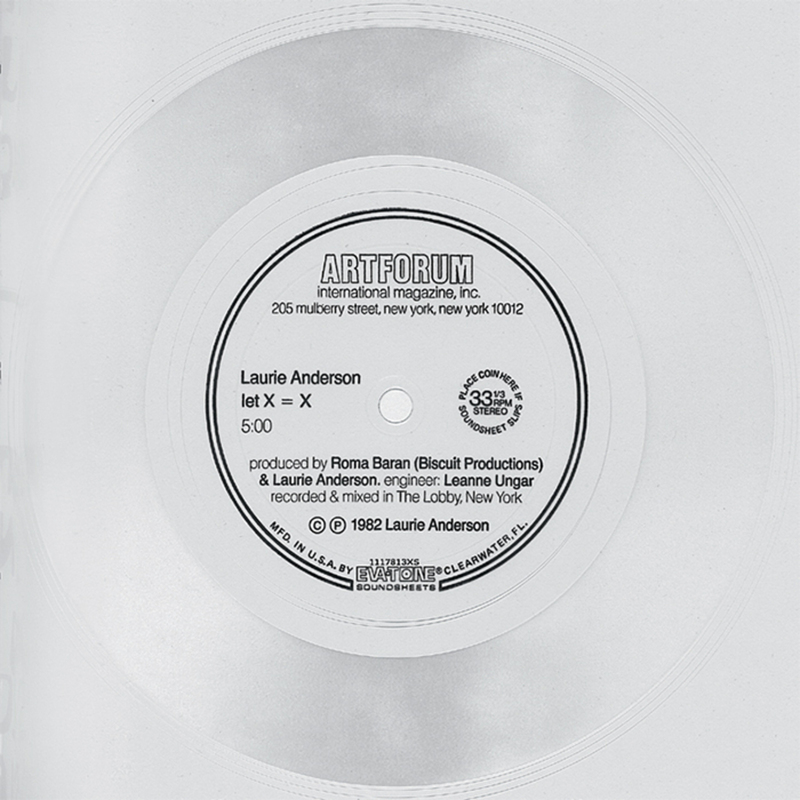 Flexi-disc insert of Laurie Anderson’s “let X = X,” 1982, included in Artforum’s February 1982 issue. IT’S LATE SUMMER in 1980, and Ingrid and I are in Venice outside one of the Biennale parties. A crowd of collectors, dealers, and artists are jostling on the narrow sidewalk between the canal and an elaborate gate to a palazzo where the party is being held. At the entrance, two severe women with buns and clipboards ask for our names. “Ingrid Sischy. 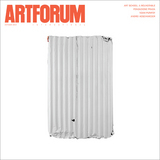 I’m editor of Artforum,” Ingrid says. Even I think she looks about nine years old, so I’m not surprised when they ask for ID, which she doesn’t have. “Very sorry, but we can’t let you in without ID,” say the gatekeepers in unctuous unison. Ingrid is supposed to be meeting some people at the party and she says to me, “C’mon, let’s go around back and climb in a window.” Which we do. In the early ’80s, Ingrid was one of the few people in the art world who had a very broad idea of the way art fit into the overall culture. Pop culture didn’t scare her. Neither did fashion. She was interested in everything. At the time, I had just signed a deal with Warner Bros. Records and was getting a lot of criticism from artists for “selling out.” Ingrid called it “crossing over,” and soon a lot of artists were trying it out. I’ll always be grateful to Ingrid for her support of my work. Every time I got an award, I would find out that Ingrid was somewhere behind it, pulling some strings. She invited me to put a flexi-disc of one of my songs, “let X = X,” into the February 1982 issue of the magazine. “Why not records?” she said in her voice that was half language, half laugh. She talked as if she were thinking of the words for the first time. In her grave mode, she could also speak in a way such that each word came out carved in stone. Ingrid was brilliant. She was a neighbor out on the East End of Long Island, and every time I saw her there we would happily gossip in the most delightful, conspiratorial way. She was fascinated with people and their motivations, and she loved analyzing behaviorshe was an absolute master. Ingrid was born on the same day as my husband, Lou Reed, and this magic tie was part of our friendship with Ingrid and her beloved partner, Sandy. We both shared the great pleasure and honor of being part of a couple that was an extension of ourselves. Ingrid was grateful to have a partner who was an inseparable best friend. There’s a photo of the two of us from 1998 at some kind of fashion eventI think it’s at the VH1 awards. Ingrid’s sense of style was breathtakingly original. Whether she was at a high-fashion event or dropping in to the health-food store in Montauk, she was always perfectly dressed, in the sense that “perfectly dressed” means you know who you are and dress like it. Laurie Anderson is an artist based in New York.